The weird solitude, the great silence, the grim desolation, are the very things with which every desert wanderer eventually falls in love. You think that very strange perhaps? Well, the beauty of the ugly was sometimes a paradox, but today people admit its truth, and the grandeur of the desolate is just as paradoxical, yet the desert gives its proof. What Van Dyke established, for perhaps the first time in American literature, was an appreciation—on an artistic as well as spiritual, scientific, and personal level—for the beauty of the desert wilderness, not in spite of its desolation, but because of it. This new aesthetic embraced the minimalism of the flat horizon, the subtle shading and gradations of color in the dry dusty sky. It welcomed the challenges of hostile sun and heat and deep solitude for their purifying effects on the psyche. 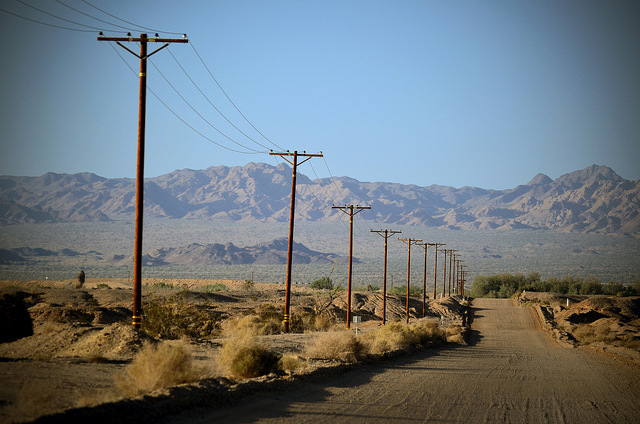 Van Dyke was the first in a long line of writers, artists, filmmakers, and photographers to seek out these qualities of beauty contained within the desert’s emptiness. His work built the foundation for a new literature centered on the harsh minimal beauty of the desert, setting the stage for writers like Mary Austin and Edward Abbey. Just three years after Van Dyke’s tour, water was brought across the valley from the Colorado River via the Imperial Canal, irrigating acres of otherwise bone-dry desert dust. Almost immediately, farms and small towns and homes sprang up on the empty landscape. Then, in 1905, irrigation waters broke past weak diversion channels and flooded the lowest part of the valley basin, creating the 30-mile-long Salton Sea. For a time, the shore of this sea was filled with resort towns. But alternating years of flooding and evaporation destroyed the beaches, ruined homes, and finally diminished the sea. These fluctuating water levels combined with agricultural pollution have left those former destinations as partial or complete ghost towns. The modern desert aesthete has to seek a different kind of desolation: The desolation of fresh ruins, of the failure of humans to tame an utterly indifferent environment. I‘ve been a photographer of the Colorado Desert for years, and I seek out the natural as well as the man-made for my subject matter. When I lived in San Diego I made day-long excursions over the coastal ranges and into the desert many times. A few years ago I moved to Portland, Oregon. I missed the quiet emptiness of the desert, the specific and unique form of desolation it offered, so recently I left Portland to spend a month living in the small town of Niland, California. I took pictures. I met the locals. I wrote. In the first few weeks of my stay I drove up and down the 111, along the eastern shore of the rapidly receding Salton Sea. The road is two lanes of light traffic, a little lonely. Sometimes I would pass big rigs, sometimes they would pass me, and my car would shake in their wake. Sometimes I would see no other vehicles on the road for miles, just the long freight trains that snake through the valley, running parallel to 111 from Niland to Indio. I would try to match speed with them for the company; it was reassuring to know that I wasn’t the only living animal out there. That out there, somewhere, there must be a destination worth traveling to. 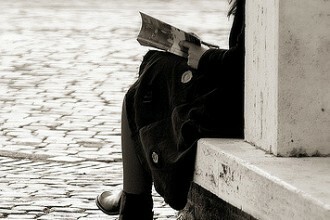 I memorized landmarks from repeat trips so that I could feel like I was someplace, that I was getting somewhere. There was the tall railroad trestle next to the road at Salt Wash past Bombay Beach. There was the ruined structure of unknown purpose, its tower topped with what looked to me like a large mortar shell. And there was the trio of abandoned houses, surrounded by empty space, covered in elaborate graffiti. I got out to explore the three houses on one of my drives. They had their own road leading up to them, just off the highway and were bordered by a dilapidated chain link fence and a dead ironwood tree, dry and gray with its thin limbs and twigs stretched every which way. All the windows were open apertures broken by vandals—shards of glass clinging like jagged teeth from empty frames, shredded screens on back porches hanging like veils. The houses had a haunted feeling. They were clearly long abandoned, but every time the wind rattled a door hinge or whistled through a gap in the wall I would look around fearfully. It was hard to know how long they had sat like that, simultaneously preserved and battered by the elements. It seemed they could have been occupied just as easily one month ago as a decade past. I walked around the houses, looked at the holes broken clear through the walls and the colorful graffiti covering every side. In the tags I recognized the work of multiple artists, probably created at different times by kids from the coastal cities on road trips—pleasure drives through the apocalypse—looking to make their own mark on the wasteland. I walked past a collection of spray-painted fish drawn in graceful strokes with exaggerated teeth and swirling colors. On another wall I discovered a series of abstract portraits done in bold black lines, men wearing neckties, their eyes drawn with dashes or backstrokes or pound signs, their faces bland, bloated and sad. There were tags that were mere words, slogans: in black paint on a gashed plaster wall, …but for the grace of god go thee; next to a doorway with no door that looked down a hallway at more broken walls, The end is near was written in the same hand. It was hard to argue, in this ripped up shell of a home, with its bare concrete floor covered in drywall fragments and tumbleweeds. Half the damage done by trespassers and vandals, the other half by the not-so slow destructive forces of nature—the wind, the monsoonal rains, the unending fire of the sun. The desert needs only an opening to do its work. Outside this house, next to a neat elliptical hole framed by bits of broken stucco, I found a tag, a mix of carefully drawn script and block lettering: Desolation is KEY. Half fragile and delicate, half hard and geometric—the filigree from the cursive D a graceful curving swoosh curling coyly in on itself, the E three parallel horizontal lines of equal length arranged to form a square. When I look for an answer to the question of why, in all this nothing, homes like these were built and why people like me show up to photograph—and vandalize—their persistent remains, I can think of no better answer than this. Desolation is key: It attracts and repels, represents both a challenge to overcome and the inevitability of decline. Desolation drew settlers and engineers and capitalists to the valley to make the desert grow, to cash in on their collective vision of a paradise hidden under a dry crust of desert varnish. 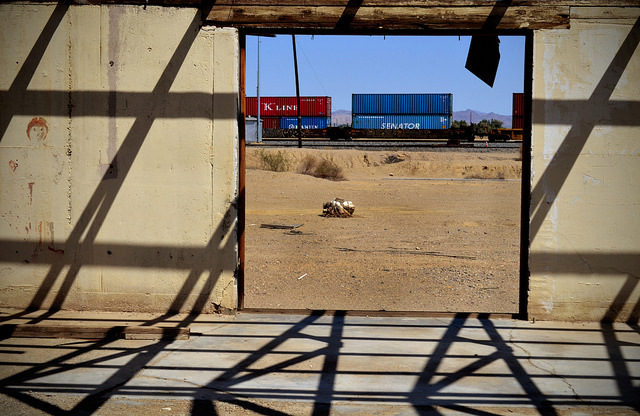 Desolation is what now brings carloads of amateur photographers and artists to the valley to tour the destruction and ruination—the result of trying to make the desert into a productive garden. Desolation makes a space for people who have no other place to be; it accommodates those who feel cast aside by society. Desolation is the key to all of the reasons that the desert of the Imperial Valley remains unconquerable, and therefore attractive, to the right kind of person. The thing about desolation in Imperial is that it takes on such different shapes. There is still, in the wild places, the desolation of Van Dyke, the sterile and beautiful emptiness. Encroaching on that natural solitude are the modern ruins, the recently built towns and their more recent destruction, the stink of failure still clinging to them. This—the etching of loss and sadness still legible in these ruins—is what the new desert-explorers seek, and the line that separates aesthetic appreciation from exploitative voyeurism is a thin one. I know this because every time I take my camera out of its case in Imperial, every time I turn on my recorder to capture a conversation with a local, I walk that line. And I can never say, with any certainty, which side I stand on. The present lure of Imperial for the new desert aesthetes is centered on the Salton Sea. For such a solitary-seeming place, it’s startling just how well-trodden the landscape actually is by photographers, filmmakers, and writers. On Flickr, the same kinds of images pop up again and again—the skeletal remains of desiccated tilapia, the dead trees, the salt-encrusted ruins of trailers. I’m shocked to see repeats of exact scenes by different photographers, posted sometimes years apart—the same ’60s era wooden dome-framed travel trailer imploding, the same chair sitting by the shore at Bombay Beach, the same trio of dried trees. I’ve photographed these exact sights myself, these exact tiny details in a vast and lonely landscape. 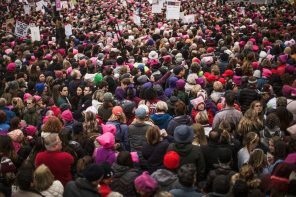 How can it be that so many others stood precisely where I stood, that we were all, separately, moved by the same imagery? The repeats are more apparent in writings about the Sea. Always, in practically every blog post or article about this place, the language follows a pattern. Without fail, the sea is described as apocalyptic or post-apocalyptic, the water is a toxic soup, the locals are weather-beaten, the smell is of death. Every article starts by telling the same story in the same way: water-greedy farmers created the sea by accident; in the ’50s and ’60s it became a resort destination with yachting and fishing for the likes of the Beach Boys and Sonny Bono; in the ’70s it began its long decline, when the water started evaporating, when pesticides and salinity started becoming concentrated in the water, when the fish started dying and littering the shorelines and creating a stink that could, with a good wind, drift through the valley all the way up to Palm Springs. These characterizations, and these narratives, are not untrue. In fact, they’re how I find myself describing the Sea to friends or family, sometimes in writing, when I want to get at the story quickly and simply. But still, in its very simplicity and myth-like repeatability, there is something in the way this story is told that smacks too much of fable. The moral of this fable is clichéd: It’s about the failure of man’s attempts to tame nature and the short-sighted greed of capitalism. Read any news story about California’s drought, earthquakes, or fires—in the comments section will be the story of California as a land of sin and excess that is now receiving its inevitable punishment. What the fable excludes in its simplicity are some very important details. There are people living on this land, often in poverty, often without the resources to leave. The official myth of the Salton Sea has one conclusion: the Sea was an accident that shouldn’t exist; we should let nature do its work and allow the Sea to disappear. To believe this, you have to accept another parallel conclusion: the people who live on the Sea do not belong there, and whatever happens to them when the Sea dries up is what they deserve. Reading articles about the shoreline towns, seeing the way the locals are depicted in photographs and in documentary films—treated as mere punchlines in some grand camp joke—the undercurrent is clear: it’s permissible to ignore the struggles of the inhabitants if their presence there, like the existence of the Sea, is just one big mistake. When I was living in the desert, I met a man named Frank who lived in a makeshift art installation and camp compound in Slab City, a community of drifters, hermits and cold weather refugees squatting on a decommissioned Marine base on the outskirts of Niland. Two things he told me that stick: The desert does not want us here. The desert provides. We were talking in his living room on some dusty couches shaded with a tarp in mid-afternoon on a very hot day. He told me about the art, the compound, the difficulties and benefits of living so far off the grid in hostile nature. The desert provides spent rifle casings and glass and duck decoys that can be turned into elaborate works of art. 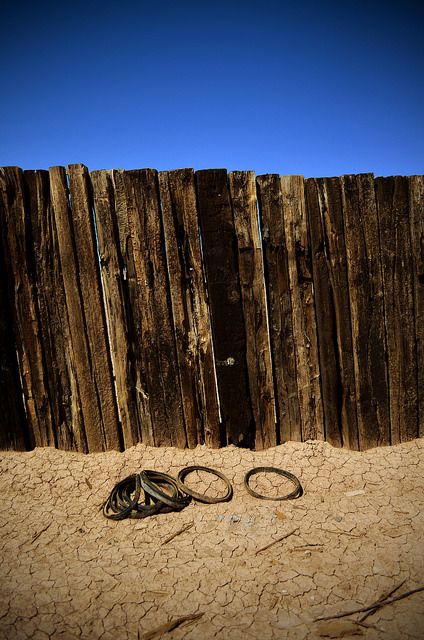 The desert provides garbage to be reclaimed, planks of wood and cardboard for makeshift walls on makeshift shacks, trailers left behind by deceased snow birds—retired nomads who move to the desert from the cold north in the fall and winter—that can shelter travelers and friends. Then the desert proves it does not want us here by sending a rattlesnake to bite the hand of one of Frank’s neighbors, another man named Frank, who nearly died in the hour he waited for the ambulance from Brawley, just 20 miles to the south. These giving and taking moves of the land are not a paradox to anyone who learns the key to understanding this place, the emptiness and ruination that offers opportunity even as it guarantees destruction. He told me, with disgust, of tourists who drive up to the gate, take pictures out of their car windows, and leave without even turning off their engines. I thought about how many times I had done the same thing, not at the Slabs, but throughout Imperial, in places too bleak to feel safe in, too desolate for me to want to call attention to myself, but picturesque enough to click the camera shutter before driving away. I can only guess from his description where he was, and those guesses come entirely from maps—from pouring over an old Thomas Guide and Google Maps and a map included in an old brochure distributed by the Southern Pacific Railroad that gives old place names and lists some of the main mountains enclosing the valley. Van Dyke’s Lost Mountains were the “last considerable group of mountains between the divide and the low basin of the Colorado Desert,” but he carried no map and wandered mainly according to the availability of water and natural beauty. Geography was not his primary concern. Instead he was concerned with aesthetic value and nature, and with his growing love affair with the desert valley. I imagine that, at some point in my wandering by car around the valley, I must have seen Van Dyke’s mountains. They could be the Orocopia Mountains, which run north of the Chocolate Mountains along the northeastern edge of the Salton Sea, or the Chuckwalla Mountains, which run directly to the east of the Orocopia. I’ve seen them both from the valley floor, from the 111 and from behind where the 10 runs through the divide between the Mojave and Colorado Deserts. Of course I didn’t know, when I was looking at the mountains in front of me, which mountains they were. There was nothing to indicate the moment that the Chocolate became the Orocopia became the Mecca Hills became the Little San Bernardino Mountains. I just saw a wall of brown rock, seemingly unbroken until I turned off the highway and drove straight at it along small dirt roads, when the perspective would shift, and the wall would open into canyons and washes and sometimes even an oasis of native palm watered by desert springs. When Van Dyke finally reached his Lost Mountains, he found a faint trail and followed it to the top of a peak where it became apparent that human hands had once, long before, shaped the rocky landscape into something more hospitable. At the top the mountain was leveled off and presented a view across the valley below, and there he found the ruins of an ancient Indian camp. The Cahuilla band of Indians still has reservations in the mountains around the valley. Back in Van Dyke’s day, they lived a nomadic lifestyle, traveling from the desert to the mountains and out to the coast from winter to summer, following food supplies and comfortable weather. The mountain passes and canyons, dotted regularly with underground springs that are fed by seismic activity that keeps water bubbling to the surface, were their migration routes. White settlers and explorers in the area, including Van Dyke, tended to follow those ancient routes. The ruins Van Dyke found, though, had the look of long abandonment. Reflecting on the site, he found that “traces of human activity are slight. Nature has been wearing them away and reclaiming her own on the mountain top.” Even at this mountain boundary, the forces of nature in this desert area are bent against the creations of humans. As the fable of this place would suggest, perhaps, there’s some sort of rightness to this. I’ve seen ruins around Imperial and in the mountains surrounding it that, like the ancient Indian camp in the Lost Mountains, have the look of long abandonment. It’s different than the three houses with the graffiti, which do not seem so long abandoned, are not yet cleansed and sanitized by their decay: bits of rat droppings coat their floors; the flutter of bird wings can be heard in the ceiling beams overhead; colonies of bees living in the hollow spaces between drywall and plywood. But there are older ruins, like the tiny concrete shack in the Laguna Mountains on the east shore of Kitchen Creek, just outside of the small town of Pine Valley. Or the chimney of interlocking local granite and rose quartz stones that stands alone next to some remnants of turquoise tiles from the old bathhouse at Jacumba Hot Springs. I’ve seen the caved-in train tunnels, the fallen and rusted railroad cars clinging to the slope, and the 630-foot-long, 186-foot-tall Goat Canyon Trestle along the now disused Carrizo Gorge Railway that winds through the steep-sided, boulder-strewn canyons from the In-Ko-Pah Mountains to the desert floor. These old ruins have been wind- and water- and sand-blasted clean and sterile. They are past the most extreme period of decay. What’s left of them now—the stone and metal, rusted as it might be—has been incorporated into the natural landscape and will endure this way for years to come. They are relics completely of the past, belonging only to history, entirely removed from the present flow of time. What remains seems complete, monumental, and historical. I feel at peace in places like these. There isn’t that sense, looking at the bones of these old buildings, of taking part in a recent tragedy, of looking in on someone’s recent suffering and leaving with a photograph, a memento just for me. These older ruins don’t seem as haunted as the newer ones on the valley floor, of which, I’ve become something of a connoisseur. I return often to track them because they constantly change—new decay, new shards of glass, new holes in the walls, new hues in the patina of rusting metal or rotting wood. These places still exist in the present, but they’re that part of the present that stands as a testament to the rule that progress, especially in Imperial, does not run in a straight line. I can read something in these minute transformations, something about the process of deterioration, about the antagonism between nature and structure until some kind of stasis is finally achieved. The best place to see the new kind of ruination is Bombay Beach, one of the smaller communities along the Salton Sea. Rising and falling sea levels during the ’60s and ’70s hit this town worse than others, the flooding destroying the parts of the town nearest to the shoreline. Trailers and homes on the sea side of a hastily constructed earthen dike still sit, rotting away, in pools of brackish water. To photographers, filmmakers and writers, this scene serves as a convenient and often repeated metaphor for decay. 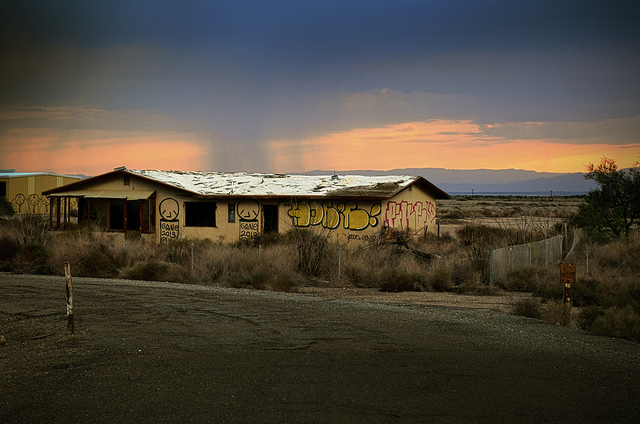 I spent a fair amount of time in Bombay Beach when I was living in Niland. 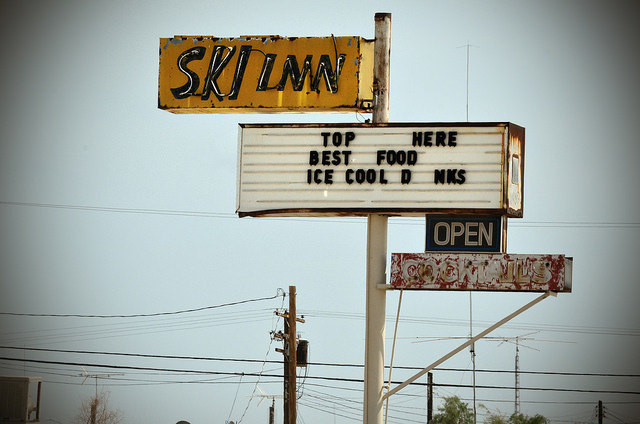 I ate several times at the Ski Inn, the one restaurant in town, because it was a short drive from my motel and because I could get better food there than in Niland. On one visit, the man behind the bar, Steve Johnson, talked to me about the town. He told me about the frequent film crews that visit the town, how they get the story wrong, how they paint a picture of the Sea that is destructive to those who live on it. 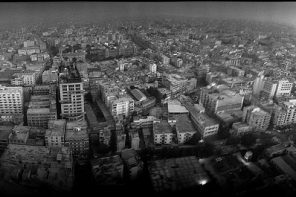 The Imperial Film Commission actively sells the desolate, abandoned towns as shooting locations. Bombay Beach is one of the most popular. “They call it ‘post-apocalyptic,’” he tells me. He brought out a book he kept behind the counter—The Salton Sea Atlas. Published by the Redlands Institute. It was a large-format hardcover full of maps and scientific information covering every aspect of the Sea, from the historic sea level to the toxicity of pesticides. He told me he had talked with the authors during their research, and they had given them this copy. He was proud of the book, proud to be well-informed about the science of the sea he lived on, about the political and economic issues threatening the restoration of his community. The media exaggerates the toxicity of the sea, he said. People in the coastal cities—where the voting power in the state comes from—read stories about the smell and the dead fish and decide it’s not worth saving. They forget that people live there. And it doesn’t smell that bad, he insisted. “It stinks!” an old-timer sitting at the bar near us exclaimed. He had lived there for decades, bought property before the fluctuating water levels destroyed half the town. He told me he wanted to leave, had a plan to move out of state with a girlfriend, just had to get some money together. But his property was next to worthless, and, as for many residents, the town had become a trap. Eating my burger, I reflected on the different views of these men both held in place by the desolation surrounding the town. To Steve, the destruction in the town served as a challenge. He was proud of his community, proud of his knowledge of the history of the Sea. The renewal of both was something to fight for, a dream that gave him and many other residents in these shoreline towns purpose. To the old-timer, the town was a reminder of the beauty that was lost when the resort town became inundated, when the Sea began to stink, keeping him in a house he could no longer sell in a community that he no longer loved. Rather than a challenge to be overcome, the destruction surrounding him signified failure. There are many other residents living along the shoreline with stories like both of these men. They are two sides to the same coin. The trio of houses on 111 with the graffiti, Desolation is KEY, stand, I later discovered, in an area named Wister, just between the irrigation channels Niland Lateral Three and Niland Lateral Four, to the south and north respectively. I didn’t know this from the ground. On the ground everything is just beige and gray, flat sameness in every direction, only the highway and the railroad to break up the monotony; I couldn’t see any reason for three houses to have ever existed in the middle of so much nothing. I looked at a satellite view on Google Maps for clues. I found Wister, a name for a place that no one calls home anymore, but the fact of its name implies that it does have a purpose, that there’s someone out there somewhere for whom Wister is a destination. Wister was just one of many railroad company towns along the Southern Pacific line that consisted—back when they were real places, back when people knew their names as stops on the train schedule—of tent houses and tent hotels and maybe even a spring or a well. I find these other towns on Google Maps too, towns like Mammoth and Tortuga and Flowing Wells and Amos. Even from the air it’s plain that nothing remains of these towns, but they keep their names, as if the hope of development still remains. Then again, this clue to history, these place names, reveal themselves only from the air, in anachronistically labeled digital maps. So much here makes so little sense from up close. On its Wikipedia entry, Wister is described as an “unincorporated community in Imperial California,” but can a community even be a community when no one lives there? Can you even call a place a ghost town if nothing much was ever there in the first place, save for three families huddled together in three plain houses? Near the three houses, I found two warehouses, invisible from the road and facing each other. They were both in bad shape, the corrugated metal walls peeled back from steel frames, debris scattered all around. One was smaller than the other. Its ceiling was almost completely open to the sky, and the wind blew through gaps in the walls. This building was divided into three rooms. In the first I found colorful graffiti, a wall of open empty cabinets, and on some scraps of pegboard, in childish handwriting, the tag See the world in a grain of sand. In the second room the ceiling was more intact, so it was darker. The walls had stenciled tags—a three-headed tiger in black and gold, a trio of identical black spray-painted roosters. The last room, even darker than the second, was gutted. Long ropes of fabric hose covered its floor. I couldn’t guess at their purpose. The facing warehouse still had most of its wall and ceiling intact, and most light came through a large open loading door. Inside was the strangest thing I had seen in Wister—dozens of vintage-looking Porta Potties arranged haphazardly across the concrete floor. Back before the Sea began to stink, campers and boaters and sunbathers would line the beaches all along the shoreline on weekends. I imagined these Porta Potties were from that era. Some were knocked on their sides, but most were upright, at odd angles to each other. They were bleached mint green or beige, with sloped straight sides forming tall trapezoids. It was clear what they were, especially since some of the doors were swung open, and the bowls of the toilets inside were not all empty. Still, in the oddness of their positioning and their mere existence in this quiet, lonely place, they seemed somehow majestic, monumental, ancient. Once, years ago, there were people here who needed the use of a toilet. It’s only through decades of non-utility that these relics could be stripped of their original use and elevated to the status of history. 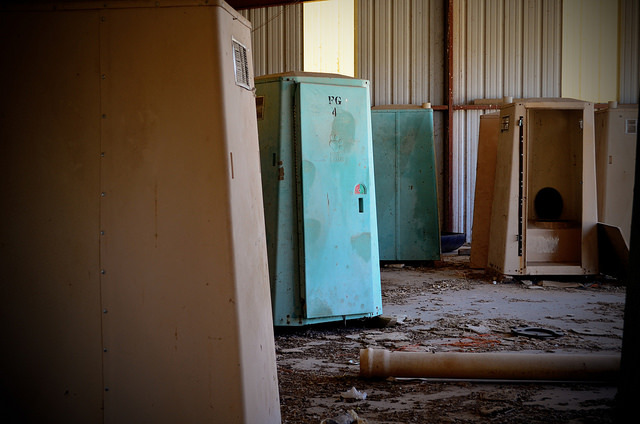 Desolation has bestowed upon these receptacles for waste, these vulgar artifacts, a sense of grandeur. The story they tell is that abandonment—of objects, of buildings, of a lake, of people—isn’t an end. It’s a transformation. All photos by Heather Quinn. Heather Quinn's writing has appeared in The Rumpus, Under the Gum Tree, The Riveter and Cutbank. She is working on a book about the Colorado Desert titled This is How You Disappear. She earned her MFA from Portland State University and lives in San Diego.